Market research is a vital part of marketing. Understanding the consumer is the foundation of every meaningful brand. Yet market research can go overboard. Focus groups are frequently called as a knee-jerk response to just about everything. Not every question needs to be validated with a focus group. 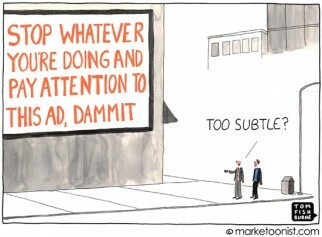 And not every focus group needs to run the same way. I’m working on a project with a client this week that includes discussion groups. But rather than host them in the typical drab conference room with a one-way mirror, we decided to treat the groups as a VIP event, held in the company’s hip offices at night over drinks. The format will be more conversational than observational. If the groups go well, they may make it a monthly event, giving a regular opportunity to bring consumers into the brand in a casual way. I really liked the scrappy market research approach taken by design studio Upwell. Upwell designed a new product called Walhub, an electrical switch cover that doubles as storage for keys, mail, etc. They wanted to test how marketable their idea was before they scaled Walhub to full production. So instead of a focus group or BASES concept test, they hijacked space at a local IKEA. They dressed up in an IKEA uniform with samples packaged to look like they belonged in the store (complete with an umlaut in the product name). Then they watched and recorded how people actually interacted with the products. Focus groups are only one tool in a market research toolkit. 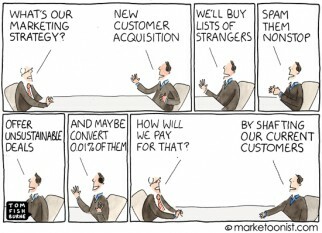 There are many ways to gather consumer insights. The art of market research is finding the best method for the question at hand. 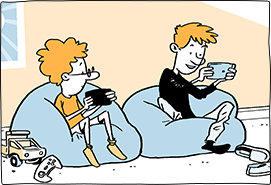 Great cartoon and video for Walhub. Just wondering, any pushback from IKEA for the high-jack? Completely agree with the point about market research as a tool kit. Very nice example from Walhub. Slightly dodgy ethically but as an independent brand I can see them getting away with it, a research agency or company on behalf of a client, not so much. Like all marketing tools, focus groups done well at the right time in the process are valuable F2F opportunities. And I reject the idea that social media is a replacement for direct interactive engagement. A tool? Sure. A replacement for actual one-on-one Q&A based on the direction of the conversation? Nope. Love the in-store test at Ikea (I am an advocate of that as being the best way to truly test what will happen at the shelf) but it’s not really a focus group… though we ran mock shopping experiences like that in our own controlled setting followed by a sit-down to explore a range of consumer questions. And I’ll never forget the look on our client’s faces when they realized “they don’t know who we are” — in that case, a score for the one-way mirror. your last sentence says it all…..”The art of market research is finding the best method for the question at hand.” At our company mobile is the way to go, so everything needs to be a mobile study! Doesn’t matter if other process would work better/cheaper…. we need to do it via mobile! I couldn’t agree more Tom! The worst research is unnecessary research and the 2nd worse is when a method is chosen that inherently can’t validly address the business issues it was intended to solve. And what I really appreciate about this weeks post is how it puts a spotlight on the fact that there is a massive missed opportunity when strictly adhering to comfortable methods like focus groups. If you are a marketer or P&L owner and you agree, be sure to encourage your marketing research internal team or external partner to go beyond a narrow defined tool kit. A good many corporate MR and insight professionals want to try new approaches, but often don’t feel empowered to push it through — and others are conservative, and don’t have time or money to spend on something that MIGHT not deliver what you expect. But if you are willing to take a risk, then say so and they probably will as well. And it would be great if you also hold your other teams, like sales, R&D, PR and marketing, accountable to learn and share the learnings when they are “out there” inter-acting with the customers and stakeholders that make your market. It doesn’t take an official formal research project to learn a lot — but it does take intentional effort to harness that insight and deploy it broadly across an organization. There wasn’t a concept tested or explored through a focus group but a savvy product testing effort. Excellent product placement. Walhub has wickedly smart people to conceive and execute such a wildly successful IDEA. Starting over 20 years ago and putting into practice for the last 15, we have been doing ….as Dulce Paredes at Takasago calls it, hybrid research. We believe in the qual-quant work we do and the success of our clients and students shows it. We feel traditional focus groups can do a fine job validating when they are constructed and moderated properly. 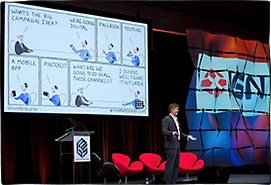 Whether on the net or in person – focus groups can validate. But to innovate, discover, RESEARCH, understand, walk in anothers’ shoes, it’s a conversation. It is a dialog. It is not…..a series of questions that we ask you and you answer. Tom, your examples are about getting in and learning. We call what we do qual – because it is small scale, not 150 people, but it is great research that iterates and pays forward. In a relationship economy, it can mean success. Thanks again for a compelling cartoon. There is no research substitute for seeing whether real consumers notice your product in real life. That’s why I lurk in the aisles for my food clients, watching what people notice, what do they touch, where do their eyes go in a given category. Do they notice my client’s product? Do they pick it up? Does it go in the shopping cart? What were the triggers to touching it? Was it promotion? Was it pack messaging or pack design that got it noticed? What does the packaging “say” about the product inside? How will that product be used? But I ask the questions AFTER watching the behaviour in real life. And to the shopper, I am just another shopper – no clipboard, so I try not to affect the process. It works. Large organisations in particular get nervous around innovation and this leads to the analysis paralysis and endless focus groups. It’s often a means for internal ‘sell in’ rather than gathering true insight. A tool I’ve been excited by for both internal sell in & gathering of accidental insights is from a company called ‘Watch Me Think’ http://watchmethink.com/. They get consumers to film themselves on their Smartphones at home or on the school run, etc using the products. When a focus group, or more quantatative chart/purchase intent score fails to generate excitement for a product, a video or sound bite from a cute kid or relieved mum can work wonders. And hearing consumers use their language to describe your product, or your competitors can be very enlightening. They mostly work in the UK and Australia but can go global. Totally agree, as would any brand planner worth their paycheck! Research is not a replacement for business judgement and strategy – consumers can only tell you about their current wants and needs, not the future direction your brand should take (or indeed what your pack design should look like). This cartoon is the bunk! Fresh fruit behind the glass? Everyone knows only M&Ms are served at focus group facilities. I usually agree with your perspectives, but you lost me with the banana. One problem with Walhub doing market research that way is that they are generating an inordinate amount of “impulse buying” that may or may not correlate with actual use of the product. Most of those specialty little packages of “stuff” that come out at Christmas time end up at garage sales. That should probably be only one piece of the overall puzzle. But what did Walhub learn from their “research”? They learned that if they put a bunch in Ikea, people will eventually buy some. There are no learnings about their interaction with the product beyond flipping over the tag. No learnings about who the people are. Nothing that could really be used to sell the product into Home Depot or Lowes, and nothing that proves what the consumer interaction in the store would be like without the Ikea brand to support the product. I’d classify that as a marketing stunt more than a focus group replacement. 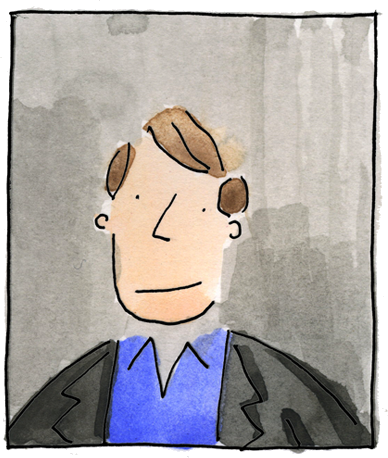 I LOVE this site Tom Fishburne – first time we at Upwell have come across it – probably because its our first dip into the marketing world. Your readers feedback is as insightful as your article, and your illustrations are brilliant! So damn smart. – We are industrial designers…not marketers. – We are launching a new product and brand with no marketing budget. – The entire marketing campaign cost $700 – conception, setup, video production and launch. – We learned what we needed to, and generated a ton of awareness in the process. – We love and respect Ikea, as well as their consumers – which is why we felt it was such an ideal testing ground. I think not telling IKEA was very risky, and frankly wrong. I hope this does not give others ideas of sending fake employees into retail stores and testing products. I hope Upwell asked permission and just failed to tell us about it. It is hard for me to like your product with this type of tactic. I am interested in the idea of this sort of testing compared to traditional methods, but not the way this company executed it. I completely agree, focus groups are simply one tool in the tool-box, helpful in some scenarios and unfortunately uninformative in others. David, we simply do not agree. But being realistic? Ask your legal team what they think of this stunt. Go impersonate a doctor and see what happens. I have presented this video to my entire Executive MBA class and so far no one agrees that this was a good approach. As I said, I am not here to argue with you or anyone for that matter. But you do not go into a company’s store and impersonate their employees…period. Good luck. Mike, I’m going to go out on a limb and say that impersonating a medical doctor is just slightly more unacceptable and illegal than impersonating a retail store employee (see lets be realistic in comment above). Its entertaining you think I have a legal team, I too often like to entertain the idea that I have a legal team. I’m sure your entire Executive MBA class has opinions. It appears as if you’re assuming I’m part of the company who did this stunt, and taking it quite personal… no one is looking for an argument, just an intelligent conversation. 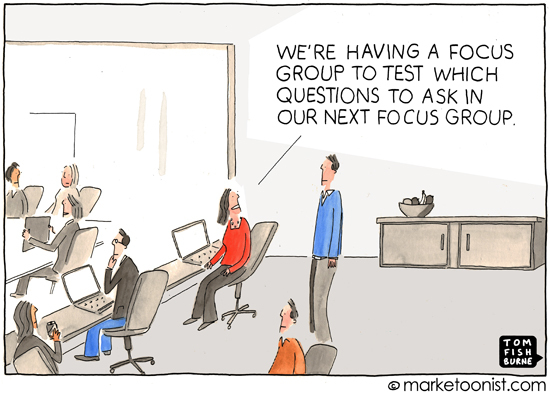 A focus group is like a gun. Useful if know what you’re doing, but you can shoot yourself in the foot if you don’t. As a copywriter creative, I’ve seen many great concepts (and quite a few products) consigned to the bin or ruined (New Coke springs to mind) by focus groups when their response was seen as the be all and end all of the process. Its a tool, a peep into the dark abyss that is marketing, but not much more. Like a gun, treat it with respect … and don’t point it at anything you want to kill. Well said LJ. Right on. It’s amazing how few marketers have actually participated in focus groups – it gives you a completely different perspective on the motivations of the group – one which, in my case, equates to having virtually written them off as a tool.